debug exposes a function; simply pass this function the name of your module, and it will return a decorated version of console.error for you to pass debug statements to. This will allow you to toggle the debug output for different parts of your module as well as the module as a whole. The DEBUG environment variable is then used to enable these based on space or comma-delimited names. Then, run the program to be debugged as usual. 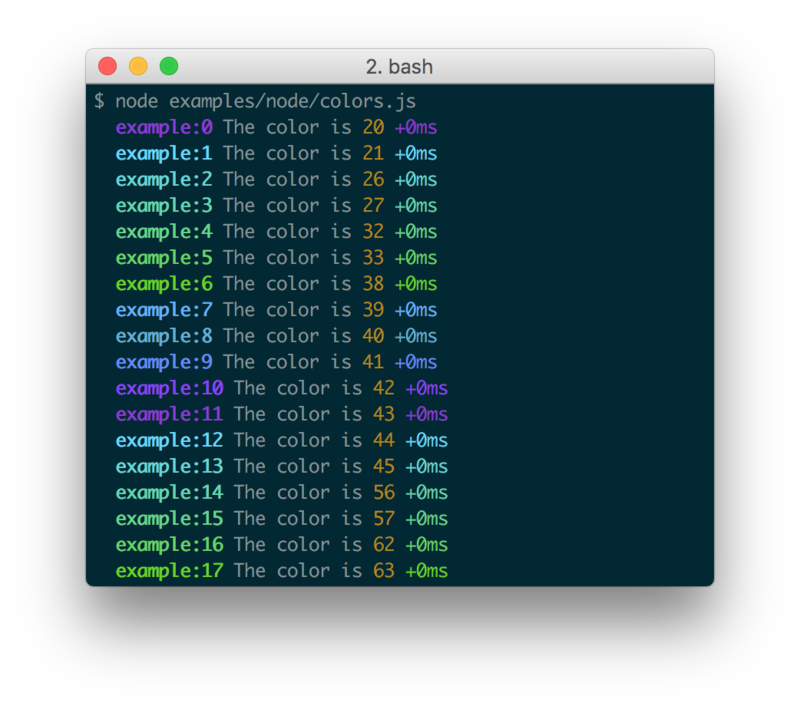 Every debug instance has a color generated for it based on its namespace name. 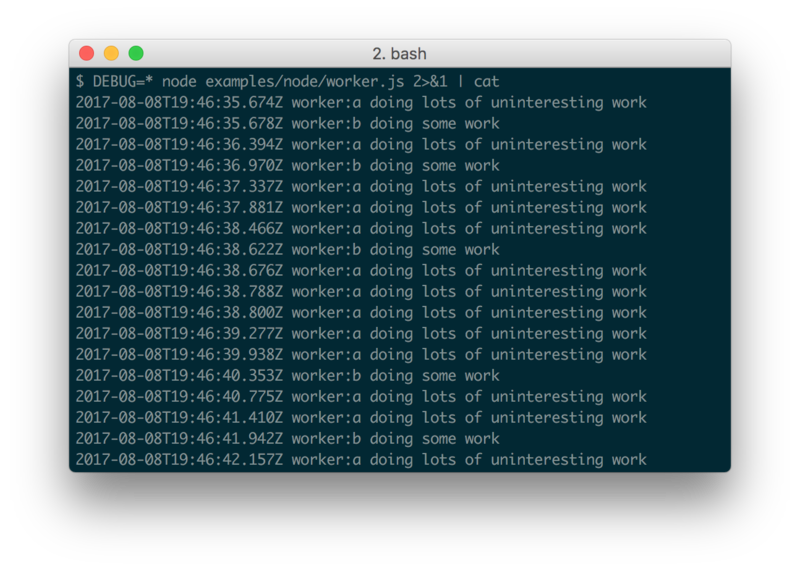 This helps when visually parsing the debug output to identify which debug instance a debug line belongs to. In Node.js, colors are enabled when stderr is a TTY. You also should install the supports-color module alongside debug, otherwise debug will only use a small handful of basic colors. Colors are also enabled on "Web Inspectors" that understand the %c formatting option. These are WebKit web inspectors, Firefox (since version 31) and the Firebug plugin for Firefox (any version). When actively developing an application it can be useful to see when the time spent between one debug() call and the next. Suppose for example you invoke debug() before requesting a resource, and after as well, the "+NNNms" will show you how much time was spent between calls. If you're using this in one or more of your libraries, you should use the name of your library so that developers may toggle debugging as desired without guessing names. If you have more than one debuggers you should prefix them with your library name and use ":" to separate features. For example "bodyParser" from Connect would then be "connect:bodyParser". If you append a "*" to the end of your name, it will always be enabled regardless of the setting of the DEBUG environment variable. You can then use it for normal output as well as debug output. The * character may be used as a wildcard. Suppose for example your library has debuggers named "connect:bodyParser", "connect:compress", "connect:session", instead of listing all three with DEBUG=connect:bodyParser,connect:compress,connect:session, you may simply do DEBUG=connect:*, or to run everything using this module simply use DEBUG=*. You can also exclude specific debuggers by prefixing them with a "-" character. For example, DEBUG=*,-connect:* would include all debuggers except those starting with "connect:". DEBUG Enables/disables specific debugging namespaces. DEBUG_HIDE_DATE Hide date from debug output (non-TTY). 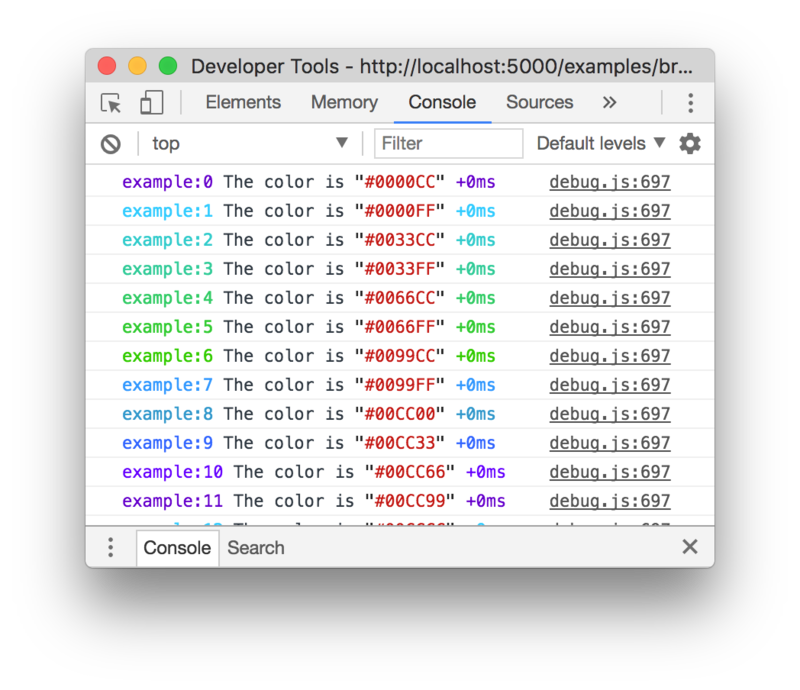 DEBUG_COLORS Whether or not to use colors in the debug output. DEBUG_SHOW_HIDDEN Shows hidden properties on inspected objects. Note: The environment variables beginning with DEBUG_ end up being converted into an Options object that gets used with %o/%O formatters. See the Node.js documentation for util.inspect() for the complete list. %O Pretty-print an Object on multiple lines. %o Pretty-print an Object all on a single line. %d Number (both integer and float). %j JSON. Replaced with the string '[Circular]' if the argument contains circular references. %% Single percent sign ('%'). This does not consume an argument. You can build a browser-ready script using browserify, or just use the browserify-as-a-service build, if you don't want to build it yourself. log.log = console.log.bind(console); // don't forget to bind to console! namespaces can include modes separated by a colon and wildcards. Will disable all namespaces. The functions returns the namespaces currently enabled (and skipped). This can be useful if you want to disable debugging temporarily without knowing what was enabled to begin with. Note: There is no guarantee that the string will be identical to the initial enable string, but semantically they will be identical. You can also manually toggle this property to force the debug instance to be enabled or disabled.